If a sign says "Tourist Attraction" there seems to be an expectation that whatever lies behind it will draw a flotilla of pensioners and excursion-starved school children in the same manner as a sign which says "wet cement" acts as a magnet for all who wish to be remembered by scrawling their names and birth dates. The very word Attraction seems to be a self fulfilling prophecy. The Super bee at Glenview on the Sunshine Coast was an attraction apparently, but despite trying really hard one fine sunny day, we could find nothing attractive about it. It was an attraction with a small "a", and I write in past tense because its owners, having officially announced its demise, are preparing to move their honey processing business a thousand kilometres south, leaving nought but happy holiday memories for the thousands that apparently flocked their every year, or perhaps, if the closure of the establishment can be taken as a sign of financial success, who didn't flock there at all. From the welcoming green forty four gallon drum at the entrance with the blurry superbee carelessy stencilled in white, with its little row of soldiers formed from butts from hastily drawn last-minute durries on the way in, to the decaying and somewhat leprositic concrete images of Snow White and her merry band, it was difficult to find anything that was either relevant or attractive about the whole catastrophe, except of course for the honey, which to be fair, could be bought at any supermarket for at least less than the special tourist prices available direct from the manufacturer. The quality of souvenirs, unlike the quality of mercy, seemed fairly strained, the plastic cups made sense perhaps, the furry maggotts with wings and bee-stripes a little less, but the tray holding polar bear side table was beyond credible explanation. I have met a person who said her son enjoyed he go-karts, but he was five, and didn't want to see the bee display. Someone else I have spoken to of late told me that their child had gone to a party there, and that it was "surprisingly" good. Before I become accused of being cynical and less than partial, I should note that the cost of entry is nothing, and we paid the full amount on our visit. Of course if one wished to see the bees at work, or visit a demonstration at a small additional cost, (which one certainly did not) then there is a chance that one might perhaps recoup the (small additional) cost of admission to those tired displays in entertainment value, or at least perhaps some educational worth could be derived. Perhaps, if the place were bigger, one would pay the price just to rest one's weary feet. Alas, there being nowhere particular to amble, nor anywhere in particular to arrest one's attention for long enough to cause one's feet to become weary, the Bee Show didn't quite meet its potential in the customer attraction stakes either. 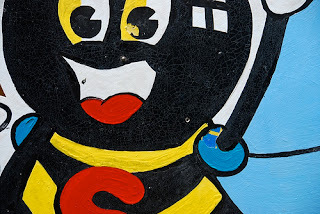 As we departed, we glanced over our shoulder at the waving Superbee smiling somewhat less than enigmatically through its multiple coats of paint, and wondered if there was any wet cement nearby. If you are seriously masochistically inclined, you may make your own assessment of these observations, by popping straight to our small Superbee Gallery on Flickr.